Thanksgiving: my recipes for success — and yours? We’re only two weeks out from my favorite holiday — the one embraced by today’s Seattle Times special Holiday Cuisine section. As we so famously do each year at our house, we’ll be hosting the usual cast of characters at our annual Thanksgiving potluck, roasting his-and-hers turkeys (one oven-roasted, the other smoked on the Weber). And because it’s tradition, we’ll once again be rolling out the Big Three: my classic recipes for cranberry sauce, Mac’s favorite stuffing and those heavenly dinner rolls. 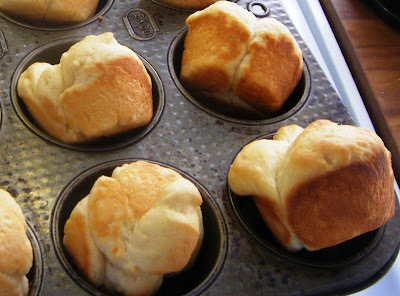 My buttermilk rolls. They’re heavenly, if I should say so myself. Our Thanksgiving entourage will include but is not limited to the “immediate family” (our closest friends, their daughter, our neighbor Leslie) and extends to our “extended family” (my husband’s childhood buddy from Chicago and his wife and kids, with whom the holidays wouldn’t be the holidays). Those “kids,” amazingly enough, will bring with them tales of college life and a fiance. How can it be? One minute they’re fighting over who gets the biggest piece of pie, the next they’re getting married to a guy who bakes ’em? 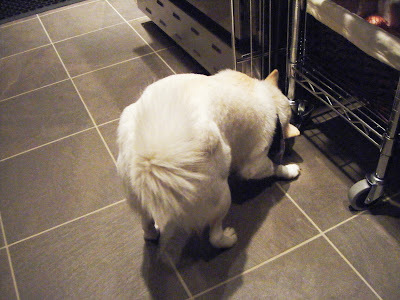 Mya Kai, showing her appreciation for the new tiled kitchen floor. I’m especially thankful that this year, instead of eating in our long skinny living room stripped of its overstuffed furnishings, we’ll be settled into our new dining room — created from the destruction of a funky old bathroom and our old galley kitchen. 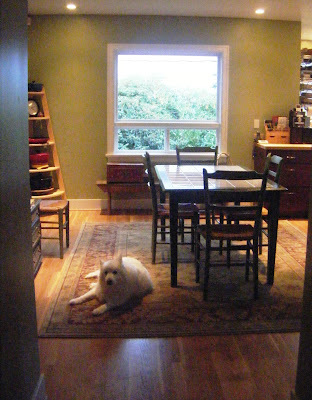 That’s Kodi — our good dog, relaxing in the spacious new dining room. For this, I am oh-so-truly thankful. 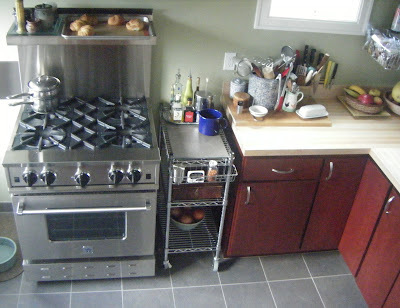 So tell me: What’s cooking in your Thanksgiving kitchen? What recipes remain standards on your T-day table?